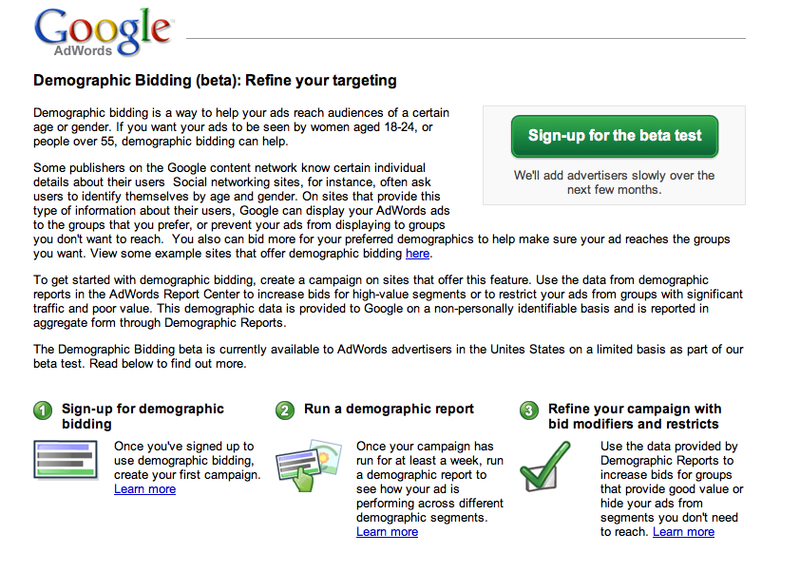 The Inside Adwords Blog has announced Google Adwords Demographic Bidding Beta. Search Engine Watch provides a link to the Beta sign up page, however when I tried to get to it I got a “problem loading page” error. By adding Demographic Bidding, Google Adwords will help brand managers and their advertising agencies reach more of their target audience. This entry was posted on January 24, 2008 at 2:56 pm and is filed under Advertising Agencies, Brand Manager, Demographic Bidding, Google Adwords, Target Audience. You can follow any responses to this entry through the RSS 2.0 feed. You can leave a response, or trackback from your own site.